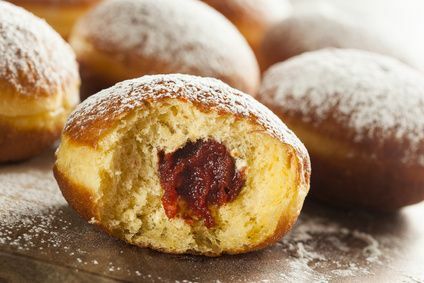 When John F. Kennedy gave his famous speech at Rathaus Schöneberg in Berlin in 1963, his blunder (‘Ich bin ein Berliner’) went down in history as the Jelly Doughnut Misconception. (I’d like it noted that I strongly disagree with the statement made in the Wikipedia entry, according to which the ‘figurative’ meaning of the sentence requires the indefinite article.) The correct version would have been ‘Ich bin Berliner’. While this goof went widely unnoticed, it is a brilliant example of an error that has since become rife even among native Germans. I am convinced the Duden will one day rubber-stamp ‘Ich bin ein Lehrer’ as grammatically correct. However, dear non-native speakers and lackadaisical Germans, it is not! Unlike in English, when expressing affiliation to a profession, religion, community or other group, you cannot use an article. In most cases, using one has no consequence, except sounding somehow ‘strange’. However, some snacks named after cities can be an issue. Beware of turning yourself into a hot dog (‘Frankfurter’/‘Nürnberger’) or a hamburger (‘Hamburger’). Simply do without the article, and it’s clear that you are (or feel like) a citizen of the respective place. To learn what linguistic oddities you can get away with in England, come back next week. The Pommes Buddha says: Pancake or eggcake – we’re all human.